Hey everyone, There's no denying that the amount of teen bloggers are on the rise. I'm 16 years old, and there are plenty of bloggers even younger than that. However, since I began blogging in late 2012, I've noticed a few things about what it's like to be a teen blogger in this day and age. Not only are there so many teen bloggers out there that I didn't even know of before hand, but we're doing it pretty damn well too. There's the #tbloggers chat on twitters, where us young adults can discuss all things bloggy twice a week. 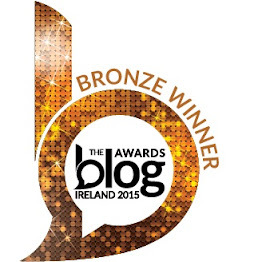 Then there's the awards- the Company Magazine blog awards now feature a teen category, and I myself was a finalist for Best Youth Blog in the Blog Awards Ireland. There are definitely some pro's and con's to blogging in your teens, and I've decided to discuss this below. I'm going to start off with the negative side to things, as I do believe it's best to leave on a good note. Over the past year and a half, I've experienced my fair share of "wow, you're great for your age" and of course, I do love a compliment! But it's the "for your age" part that often bothers me. I understand that I'm young, and less experienced than most bloggers, but that doesn't make me a bad blogger. I've seen this with alot of teen bloggers, and overall: teenage bloggers are quite underestimated, particularly by older bloggers. I haven't noticed it as much with companies, but there have been a few things I've been told I can't do or attend because I'm too young. There are definitely alot of benefits to blogging as a youngster though! When I was younger and before I started blogging, I used to read so many blogs by an older generation. Of course, it's always brilliant to gain information from more experienced people, but I did always wish to see things more for my age. Nowadays, I try to feature items that within a reasonable student budget. It's always nice to see a fresh approach, especially since the world of the internet is constantly changing. Not only that, I'm constantly improving my writing and my style is always evolving. This blog is my platform to show all of that, and has become like a mini portfolio for the future. It's regularly said that "the youth of today are the leaders of tomorrow", and this I entirely agree with this statement. Here are a few words from other teen bloggers on this issue; Tolly from Tolly Dolly Posh, age 13 The pros of being a teen blogger I guess is the fact that people think you are unique in away because you have started so young. I don't necessarily think this is a thing which is that new bloggers should think 'Ooh yes I should start blogging because of that' over, but when I first started getting followers that was quite a big factor. I would say there are a few more cons to teen blogging than pros. Starting with the fact that there aren't as many young people who read blogs. I don't think that many young people know about blogs so therefore they don't read them, this means the amount of people who read your blog is going to be smaller than an older blogger as more older people read blogs, and are generally going to read blogs by people of the same age.The second con is that people sort of... look down on you because they think your blog is perhaps 'written by a child', so it's going to be unprofessional and not very good at all. It can be annoying sometimes! Grace from Dainty Sprinkles, age 14 I've mixed opinions on how teenage bloggers are perceived in the big world of blogging. Sometimes I feel kind of uncomfortable whilst writing up a blogpost since I'm always conscious that people and bloggers much older than me and more 'experienced' than me may perceive me as patronising or basically not knowing what I'm talking about since I'm still quite young. In saying that, Alot of adult bloggers are very accepting and kind towards teen bloggers - After all age is just a number ! A good few amazing blogs I read are often dismissed or undermined due to the young age of the blogger wh owrites the brilliant content but I'd like to think that the overall opinion towards teenage bloggers is positive and welcoming. I think that being a teenage blogger definitely has two sides to it. I mean, some people will most likely place you in the mold of being ‘immature’ – just because you might only have sixteen years to their twenty something. It’s something that I haven’t personally experienced just yet – I actually tend to get people saying that they forget that I’m ‘only’ sixteen when they read my posts (probably down to my granny-like words!). 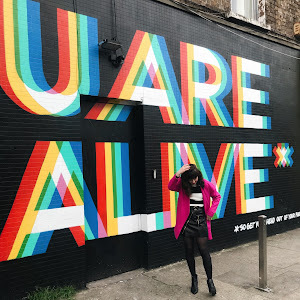 I don’t think that your age should define whether or not your blog is good – it will only reflect upon what you write about (like school, exams etc). Being a teenage blogger allows you to have time to perfect and create a blog that is completely you, and it’s also a worthwhile hobby to have - say, if you want to practice and improve your writing skills. Even though you will most definitely cringe when you look back on your first posts, you can always have a good laugh about them! Also, having a blog when you’re growing up will allow you to see how far you’ve come and matured as time passes. I haven’t encountered any problems (yet!) 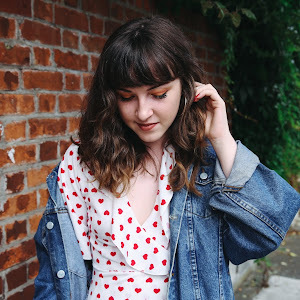 because of the fact that I am a teenage blogger – but I strongly think that a blogger is a blogger, and that your age shouldn’t make any less of a one by any means! I feel that being a teen blogger is at times quite a rewarding experience, but also quite a challenge. I adore blogging, it’s an excellent social media platform to get to know other teenage bloggers however I personally found my peers in school quite judgemental about my blog. I’m open and honest about my blog (I accidentally mentioned it to my business teacher one day and said teacher keeps mentioning it!) but some of my peers were quite negative about my blog which really surprised me! The older generation are much more open and accepting to the idea of blogs I’ve found, in comparison to my peers who appear to be hostile about my blog and make subtle digs in conversations. 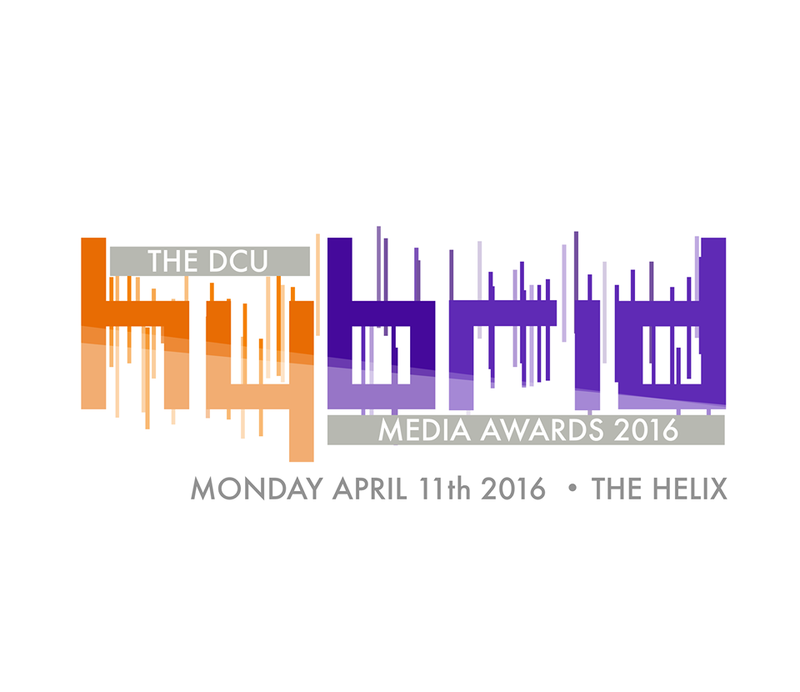 Having said that, this only makes me more determined to blog and to blog in a professional and articulate manner. I’m slightly older than some teenager bloggers so I’m not perceived as a child as I’m 17 but the younger bloggers shouldn’t be undermined due to their age, it’s only how many times they’ve rotated around the Sun. I'd love to hear your opinion on this, whether a teen blogger or not. Leave a comment below or tweet me @0mgrachel! 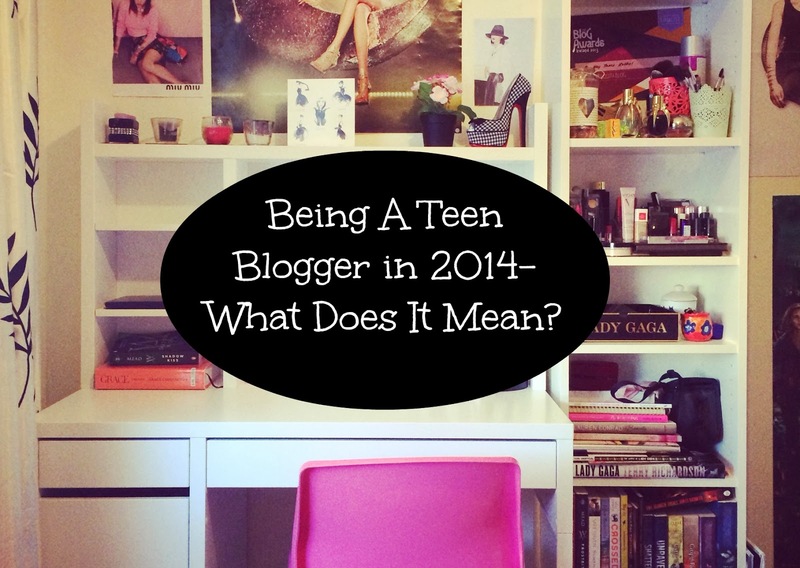 Being A Teenage Blogger In 2014- What Does It Mean? I've been really loving The Pretty Reckless lately which is why I've named another outfit after one of their socks! Taylor Momsen is so edgy, and I really want to recreate those beach-grunge waves she's known for. Believe it or not, I actually never owned a black leather jacket until now.. Crazy, right? I have a blue and a purple one, and now a black one has finally been added to my collection. I bought this choker on Etsy recently, and I adore it. It's so 90s / The Craft inspired! I haven't really been doing much lately since school started back, and already I'm living for the weekend. I have, however, been redecorating certain parts of my room, that I can't wait to share with you all. I wore this outfit going shopping last week and I was feeling a little more 'daring' so threw on some pattern tights. My mam bought me these cute Eiffel Tower ones for only € in Penneys! You really can't get any better than that. I've still been loving 90's clothing lately and this scrunchie definitely brings a modern twist on that, with a leather effect. Mid term is over now and school has restarted [sigh] but at least I got to take plenty of outfit photos during the week. Watch this space, because I'll be sharing them all here with you! P.S- what do you think of having the images on my blog the size of the page column? yay or nay? On Tuesday I had the pleasure of attending the preview of Schuh's latest collection in Kelly's Hotel in Dublin. As soon as I walked in the door, I was welcomed by not only the lovely girls from Schuh PR, but the tropical mass of shoes that filled the room. I have to say, I absolutely love the new collection! It was very different from the AW collection naturally, with sandals and vibrant colours dominating. I could definitely see that there was something for everyone out there, ranging from casual flats to crazy heels. As you can see, it appears the unusually shaped heel is here to stay- and I love it! The top left were one of my favorites, as the metallic blue almost reminded me of mermaids. These shoes are by a brand called Privileged, which are exclusive to Schuh this season, and at very affordable prices too. Colour blocking is still going strong this season and Schuh have really nailed the trend as you can see from some of the shoes above. I also love the attention to detail, like the gold buckles and chain ankle straps. However, if bright shades of blue aren't your thing, there was definitely a wide variety of more neutral toned shoes this season too. I think that those heels in the top two pictures are so dainty and glamorous! The animal print slipper like shoes are also super edgy and cute. My favorite pair of shoes in the collection are without doubt the patent black heeled sandals in the bottom right. As I'm sure you all know by know, I have an obsession with chunky black shoes, and I think these will look amazing with frilly socks in the Summer! I got my nails done by NCLA at the event- how amazing are these nail wraps?! 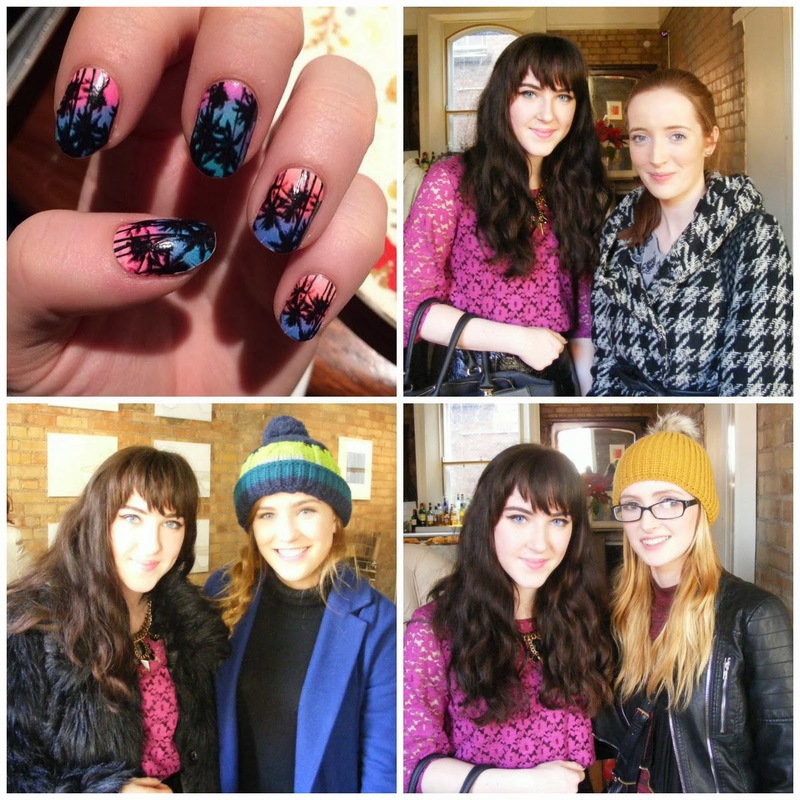 Not only that, but I bumped into a few of my favorite bloggers too- Rebecca from Bec Boop, Lily from Latest Lil and Gemma from Fashion Floor Fillers! What do you think of Schuh's SS14 collection from the images above? Hey everyone, Please excuse the cheesiness in the title, but the pun was needed! I bought this tote in New Look last week for my birthday and I absolutely adore it! It's super spacey and glamorous. I only noticed the other day that one of the gold chains on the handle is loose so I'll have to tighten it, sigh. 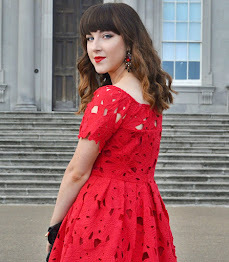 I wore this outfit to the Schuh S/S '14 press event the other day, which you can read all about this week, so stay tuned! As the weather seems to be getting slightly warmer, I dug out my PVC skirt from River Island and paired it with a lace top from Penneys. I'm quite liking taking outfit photos on the street now, but I'd love to know your opinions! Let me know what you think below. The first outfit is my absolute favorite- the acid green metallic harem pants paired with the shearling trimmed coat is so edgy and fresh. The second outfit has quite a 90's feel to it, something I've been loving lately, with the slogan tee and quilted bomber jacket. The third outfit is a dress I'd love to wear- the vibrant blue with baroque style design is beautiful! I also love the pom pom shoes, although they do remind me of Bratz doll slippers. Oh well. 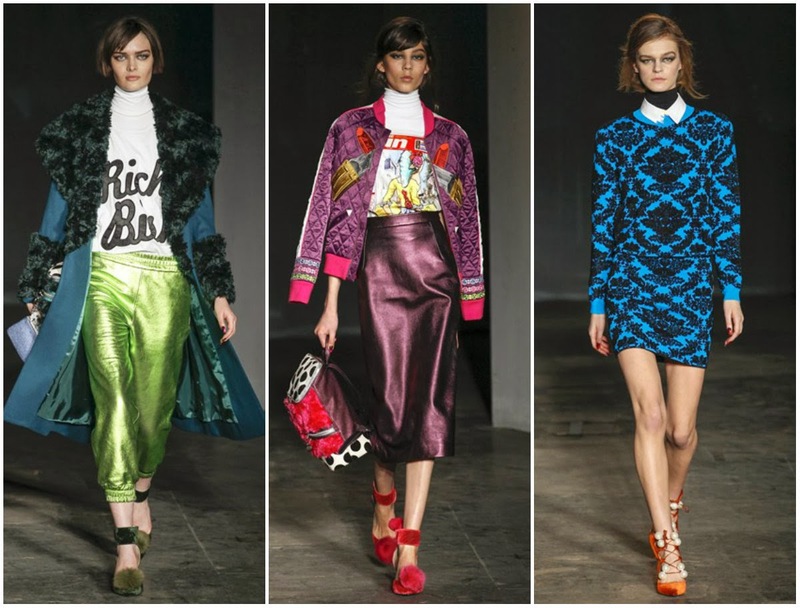 What do you think of House Of Holland's latest collection? My Signature Scent; Lady Gaga "Fame"